LOUISVILLE, Ky. (AP) — Muhammad Ali's younger brother wept, swayed to hymns and hugged anyone he could reach. He raised his hands to the sky, eyes closed, surrounded by congregants at the church where their father once worshipped. Rahaman Ali took center stage at the two-hour, high-energy service at King Solomon Missionary Baptist Church, sitting in a front-row pew with his wife, Caroline. The church is not far from the little pink house in Louisville's west end where the Ali brothers grew up. It was one of several emotional remembrances Sunday as the city joined together to mourn its most celebrated son, the Louisville Lip. Later this week, politicians, celebrities and fans from around the globe are expected for a Friday memorial service that Ali planned himself with the intent of making it open to all. Ali's body was returned to his grieving hometown for the final time. An airplane carrying the boxing great's body landed Sunday afternoon. At his father's church, the congregation stood in tribute, prayed for the former three-time heavyweight champion and his family and even dug into their pockets, filling a collection plate for Rahaman and his wife as a show of support. "There is no greater man that has done more for this city than Muhammad Ali," said the church's assistant pastor, Charles Elliott III, drawing a round of "amens" and prolonged applause from the congregation. Elliott recalled the comical side of the former boxing champion and global humanitarian, who died Friday night at an Arizona hospital. Elliott said his grandmother was once a nanny to Ali's family. He visited as a wide-eyed young boy, he said, and recalled the house had an elevator and a parrot who called out: "Here comes the champ, here comes the champ." His father, the Rev. Charles Elliott Jr., knew Ali for decades and remembered his generosity. He recalled when he was raising money in the 1960s to keep a program running to feed the city's hungry, and Ali cut him a check. At the time, the program offered food twice a week, he said. "He came in and he said, 'Reverend, let's feed 'em every day. I'll give you a check,'" the elder Elliott said. The solace he found Sunday morning, he said, was that Ali's suffering was finally over. 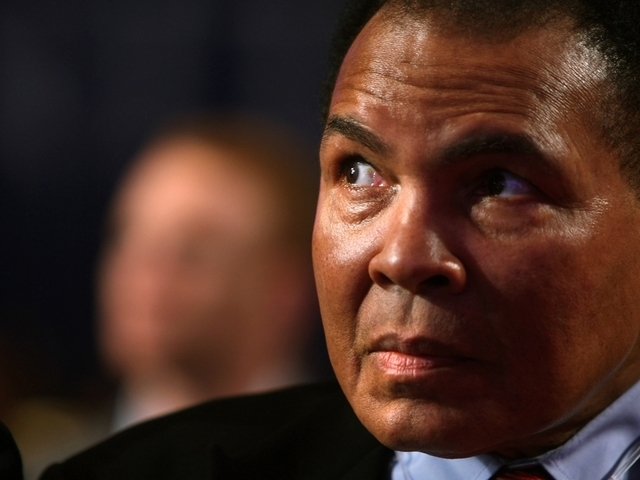 He noted that Ali's daughter said The Greatest's heart kept beating a half-hour after the rest of his organs failed. "Ali always did something nobody ever did," Elliott said. Ali's father, Cassius Clay Sr., a painter, was a member of King Solomon before his death decades ago. He painted a mural of Jesus' baptism that still hangs behind the pulpit. Muhammad Ali sometimes accompanied his father to the church, even after the boxer had announced his conversion to Islam. The Rev. Wanda McIntyre, who presided over the early service, said it reminded her that he believed above all in living life with tolerance and an open heart. "Rivers, lakes, ponds, streams, oceans all have different names, but they all contain water," he once said. "So do religions have different names, and they all contain truth, expressed in different forms and times. It doesn't matter if you're a Muslim, a Christian, or a Jew. When you believe in God, you should believe that all people are part of one family." Andre Watkins had his own way of paying tribute to the champ, shadowboxing Sunday morning outside King Solomon. "I thought he couldn't die he was so good," Watkins said. Elsewhere in Ali's hometown, the memorial grew outside the Muhammad Ali Center as fans poured in from far and near for the glimpse at history. They left boxing gloves, butterflies and handwritten letters. Joseph Obiri put on his Muhammad Ali T-shirt, the same one he's worn in tribute since the news of the boxer's death reached him, and brought his 2-year-old son Samuel from their home in Cincinnati. He took lots of pictures so that years from now, the boy will be able to look back on this day and know he was part of something special. Leslie Neidig added three bouquets of flowers to the growing memorial outside the Ali Center. She said was in elementary school in Louisville decades ago, when the teacher announced that Ali would come by to talk to the kids. It frightened her, she said, expecting the famed boxer would be intimidating. But he surprised her. What she remembers now is his big smile and big laugh. "I felt like he cared about all of us, all of us no matter what we looked like," she said.